The Lady Timberwolves played their hearts out in the first scrimmage last Thursday against National Collegiate Prep. With a final score of 9-9, the team was led by pitchers Kaziah White and Malaysia Johnson. Additionally, this team's offense was on fire! 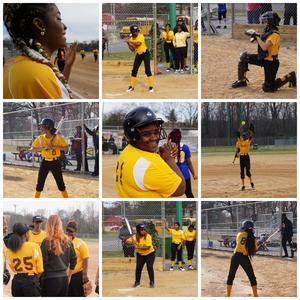 Sophomores London Rush, Moet Dupree, and Dianshe Robinson all recorded hits for the Timberwolves, along with a double from 11th grader Kendi Trejos and two hits from 11th grader Ceon Dubose.